View the street view panorama near a location on a map. Street view panorama is provided by Google to allow someone to get a visual display of a street and move through the street. 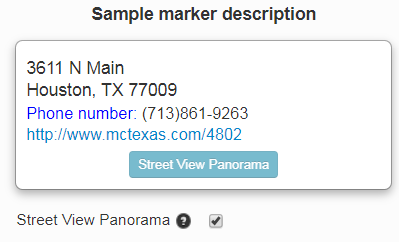 This is not available for every location, but an attempt will be made to see if it is available when the “Street View Panorama” button is clicked. When the street view panorama is available it will be placed over the entire map. There is a button to exit the street view panorama in the upper right. This option is available to subscribers and can be enabled below the sample marker description (as seen in the image). Street view panorama is a great way to get a visualization of a street or an area without being there. It can be used when looking for apartments or houses to get a feel for the nearby houses, streets, and overall neighborhood. It can also be used to get an overview of an area before traveling or instead of traveling.